Over 70 people were evicted and arrested after police raided a new camp near the Dakota Access pipeline construction, claiming it was illegal. The arrests come a day after federal officials started a final review of the pipeline. 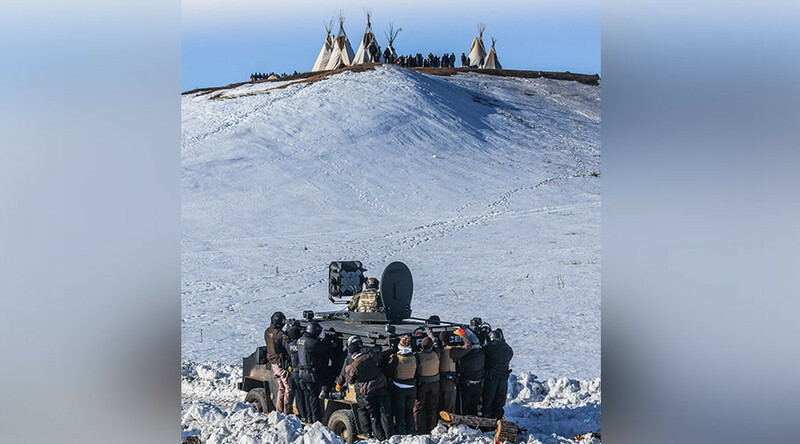 The new camp was erected on a hill Wednesday morning, a quarter of a mile from the original Oceti Sakowin camp in the floodplain. Seven tepee frames represented the seven tribes involved in the protest. "This is just what Crazy Horse went through when he took his last breath. He fought to his last breath, so we can be who we are, live our lives the way it was intended by the creator," a protester, Julian Bearrunner told KFYR-TV. The new camp was spotted by officers who claimed the new camp was built on private land. By afternoon, police armored vehicles had assembled near the site and riot gear police, armed with batons and automatic rifles dismantled the camp, evicting and arresting the activists. Protesters had linked arms as police peeled them off one by one. Activists were taken to five different jails across the state. The latest confrontation comes a week after the Trump administration issued an order demanding a revival of the Dakota Access pipeline and the controversial Keystone XL pipeline, reversing two significant decisions by the Obama administration. The raid, eviction and arrests were also a day after federal officials said they’d began a final review for the $3.8 billion Dakota Access pipeline crossing of Lake Oahe in the state. “There were a lot of people who felt like the prospect of treaty rights were something worth getting arrested over,” Linda Black Elk, a member of the Catawba Nation told the Guardian. On Tuesday, the Standing Rock Sioux tribe said the Army Corps lacked the statutory authority to stop the environmental impact statement, and that they had not received formal notice that the EIS had been suspended or withdrawn.